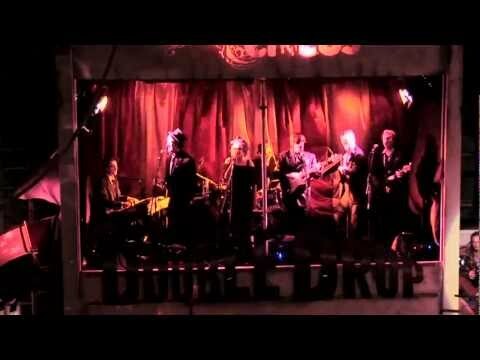 The Carny Villains are a six piece theatrical band from Bristol, known for their raucous blend of stomping swing, ska and Balkan-style folk played with the riotous energy of punk rock. Their enigmatic and animated live shows remain unrivalled for their mix of theatre, humour energy and showmanship! Their journey has been quite different from most groups. Beginning life in 2009 as the house band for The Invisible Circus, they went on to compose and perform over 50 original live scores for circus acts and theatrical shows, creating live musical installations under just about any guise you care to think of. Following the release of their debut studio album ‘Why Am I Here’ in 2015 they went on to perform high profile sets at many major UK festivals including peak time sets at Glastonbury’s Shangri-La Hell stage, where they performed to a full arena of 5000 enthralled festival goers and subsequently rebooked for the same stage in 2017. In 2016 they played main Stage at Boomtown Fair as well sets at Wilderness, Bestival, Shambala and many more. With several sets at Berlins infamous Fusion festival and a main stage set to 40,000 people at Colours of Ostrava in Czech republic, the Villains are no stranger to overseas touring. Tours to Germany, Italy, France and Austria have increased audiences in Europe and have led to yet more orders of CD’s and merch to replenished rapidly dwindling stocks. Regular appearances at street festivals such as Penabilli in Italy, Linz in Austria and St Galen in Switzerland have allowed the group to perfect their infectious showmanship skills and their ability to work a crowd. Definitely one of the best live bands I’ve seen this year.